A tetris game where 2 players can reach the max score without any distinction is not a real tetris..
WE can't fault them for thinking no one woudl be able to do it, okay? If we had MAME replays, we could rank them by frame count, which is probably what MARP does. ahh, but you can do it without maxing out the lines there is a super play replay that comes with Sega Ages #28 where the player maxes out with 600 lines. jm2003: thanks for the pic. 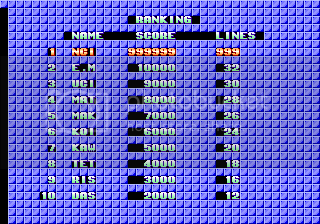 were you at 999 lines when you maxed the score, or did you keep playing until you hit 999 lines? actually i did anticipate the possibility of a "tie." that's why most recent takes the lead. I'm with tepples in having the fastest time as tie breaker though. Seems a lot fairer. and whether it's fair or not the way it is, it's a motivator to the player that gets bumped down to play again. i was reffering to the game designers, not the thread maker. They didn't expect people to max it. ANyway, mame replays are the easiest way to check. but that excludes the console. I will upload the wolfmameplus106 inp later. Anyway,Sega tetris was and is ,for me, the best game of tetris i've known.You cant build waiting a I ,becouse it can appear too late. Tgm and rest of actual tetris have an algorithm for every piece appears when you need. Im just playing my first games on Texmaster.Two days playing and got S8. Not quite. TGM has a randomizer that makes it less likely you'll get a piece that you had in the last four pieces. While that does mean that you'll be less likely to be starved of a piece, it doesn't just give them out to you whenever you need them. Which mode are you playing? looks like you had a breakthrough in survival Kitaru, and not a bad pts/line too. The inp for wolfmameplus106.Rom tetris1. I broke 100 lines now, but I have no idea how you survive 2G and up. Really? I swore I read somewhere on these forums it goes up to 2G, then 3G, then 4G, then low gravity, and repeats until you die. Unless that was for another game. i think the only way to get better is to keep playing sega tetris or heboris old style and nothing else. the skills needed to do well don't carry over at all from other tetris games IMO. you have no IRS, no ceiling, wall, or floor kicks, only CCW rotation, memoryless randomizer, and it never reaches 20G. 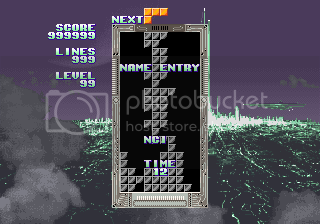 when i took a break from sega tetris and played texmaster normal mode it took a couple days to reach 999 because i'd completely forgotten how to play with instant gravity. i kept expecting pieces to reach the wall when there was an obstruction preventing that from happening. likewise, after playing a lot of 20G i'm sure you would overshoot your intended hole often in sega tetris. not to mention if you rely heavily on IRS you'll struggle with your input timing in sega. mushroom is right, and the speed remains constant after level 15.
i thought it would be fun to add another leaderboard here, for people who want to use tougher settings. this may only be possible in the Sega Ages Tetris Collection version. this is actually the first time i've beaten 63 lines and i've played a lot. i've been playing a lot the last couple weeks, and finally maxed the score again (with ~250 less lines this time ). my target was actually 900 lines, so once i got about 100,000 points ahead of the 1000 pts/line rate (somewhere around 400,000 pts and 300 lines) i started playing more conservatively. as it turned out i was able to make some tetrises here and there when they came easily, and despite only going for singles near the end i undershot my goal. haha didn't expect that. but maybe it's a good idea to keep playing when you're playing well. you never know what might happen. I think I might get back on this at some point. I'd like to max it.